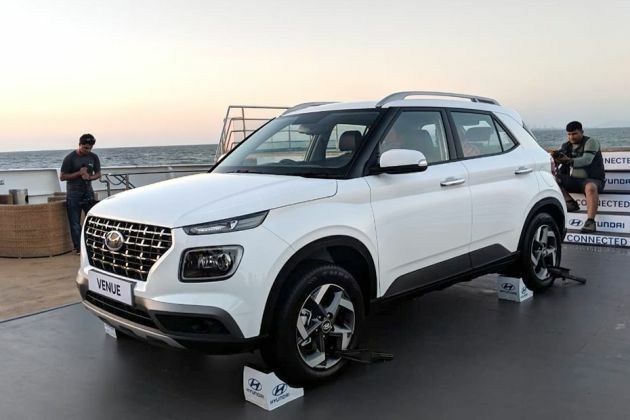 The Hyundai Venue is a five-seater sub-compact SUV that is set to launch in India on 21 May 2019. Unofficial bookings for the Venue are already underway for a token amount of Rs 21,000. The Venue is expected to be priced between Rs 7.5 - Rs 12 lakh. Its competition includes other sub-4m SUVs such as Maruti Suzuki Vitara Brezza, Tata Nexon, Ford EcoSport, Mahindra XUV300 and the Honda WR-V.
Hyundai Venue Engine Options: The Hyundai Venue will be powered by a choice of three engines. There is a 1.2-litre petrol engine making 83PS/115Nm mated to a 5-speed manual, and a 1.4-litre diesel engine making 90PS/220Nm mated to a 6-speed manual. The same engines are also offered in the Hyundai Elite i20. There is also a new 1.0-litre, 3-cylinder turbocharged petrol unit with an output of 120PS/172Nm. This will be offered with a choice of a 6-speed manual or a 7-speed dual-clutch automatic transmission. Hyundai Venue Features: Being a Hyundai, the Venue is packed with features. It offers six airbags, wireless mobile charging, cruise control, auto climate control, rear AC vents, push-button start/stop, an 8-inch touchscreen infotainment system and a sunroof, at least in the top variant. It also debuts Hyundai's Blue Link connected car technology that uses internet connectivity using an eSIM (from Vodafone Idea). This allows for live tracking various vehicle telematics and remote controls via the Blue Link mobile app. Hyundai’s Venue new sub-4metre SUV is coming late to the segment. So, has it come better prepared to trump the competition? If so, how does the Venue plan to wow?